CRRT Market size is set to exceed USD 1.3 billion by 2024; according to a new research report by Global Market Insights, Inc. Rising prevalence of chronic kidney disorders will augment the CRRT market growth during the forecast timeframe. According to National Kidney Foundation, around 10% of population suffers from chronic renal diseases and over millions of them die every year globally. Favorable regulations by regulatory bodies such as FDA enforce certain laws on manufacturers that ensures availability of superior quality CRRT devices in intensive care units thereby augmenting CRRT industry growth in foreseeable future. Continuous venovenous hemofiltration (CVVH) segment was valued at USD 171.9 million in 2017 and is anticipated to witness high growth during the forecast timeframe. High segmental growth can be associated with increasing demand for continuous venovenous hemofiltration. CVVH program is a short-term treatment used in patients suffering from acute or chronic renal failure. According to National Chronic Kidney Disease Fact Sheet, in 2017, there were around 30 million people are estimated to have chronic kidney disorder. This is expected to escalate the demand for continuous venovenous hemofiltration therapies thereby augmenting the segmental growth over upcoming years. Consumables segment accounted for 60.7% in 2017 and is expected to grow considerably over forthcoming years. Consumables include catheters and other access products that require replacement at regular intervals. Contaminated consumables such as reused AV fistula needles may pose a great threat to life. High replacement rate of consumables will ensure high segmental growth during the forecast timeframe. 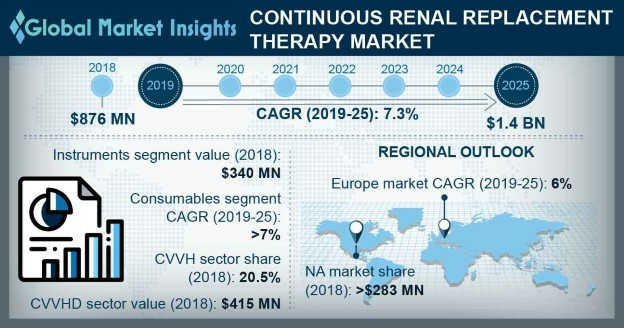 Non-renal segment will have 6.6% CAGR during the forecast period owing to the increasing preference for non-renal therapies that enables efficient treatment of patients experiencing cardiac problems. This therapy is preferred to clear ingested toxins and to maintain proper electrolyte levels by using renal drugs available. High prevalence of heart disorders amongst geriatric population will augment the segmental growth over the forecast timeframe. U.S. CRRT market held 91.7% momentous revenue share of the total North America CRRT market. High revenue contribution can be attributed to growing geriatric population suffering from acute renal failure. Also, increasing demand for CRRT by adult population has augmented industry growth. According to National Kidney Foundation, the chronic renal diseases treatment expenditure is expected to rise above USD 48 billion annually that should propel the business growth in forthcoming years. Germany CRRT market will experience 5.9% CAGR and is forecasted to grow significantly during the upcoming years. Eminent industry players based in Germany such as B.Braun are investing in the development of new and innovative CRRT systems. For instance, B.Braun has developed Omni, a new generation CRRT machine with improved users interface, reduced downtime and helped in optimizing renal dose delivery. Development of such technologically advanced medical systems will certainly augment the industry growth. Prominent industry players operational in the CRRT market include Asahi Kasei Corporation, B.Braun Melsungen, Baxter International, Fresenius Medical Care, Infomed, Medica, Medical Components, Medites, Medtronic, Nikkiso, Nxtstage, Toray. These industry players implement certain strategic initiatives such as mergers and acquisitions that help them in maintaining their market position. For instance, Fresenius Medical Care undertakes certain decision such as innovations in medical devices used in the acute therapy. It recently developed multiFiltratePRO system that is used in efficient treatment of acute kidney diseases. Development of such new products will ensure sustainable profits for the company.